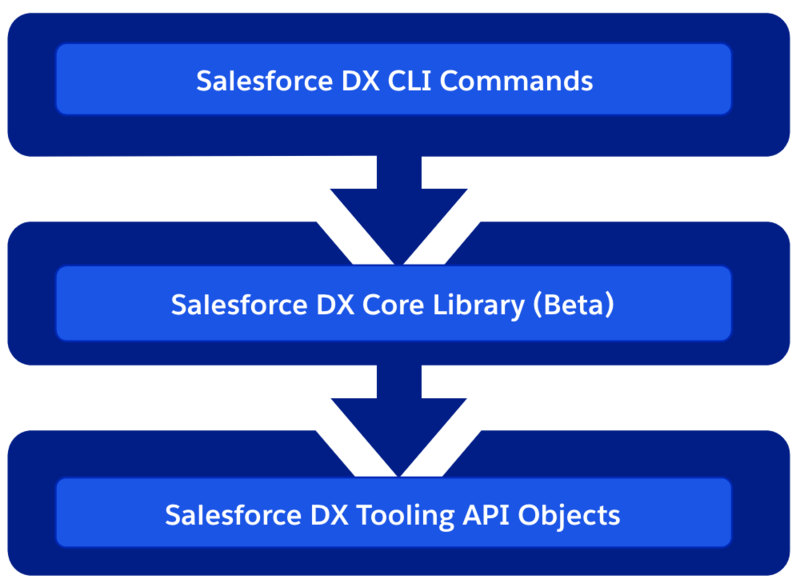 This blog will cover three ways by which you can interact programmatically with Salesforce DX. DX provides a number of time-saving utilities and commands, sometimes though you want to either combine those together or choose to write your own that fit better with your way of working. Fortunately, DX is very open and in fact, goes beyond just interacting with CLI. 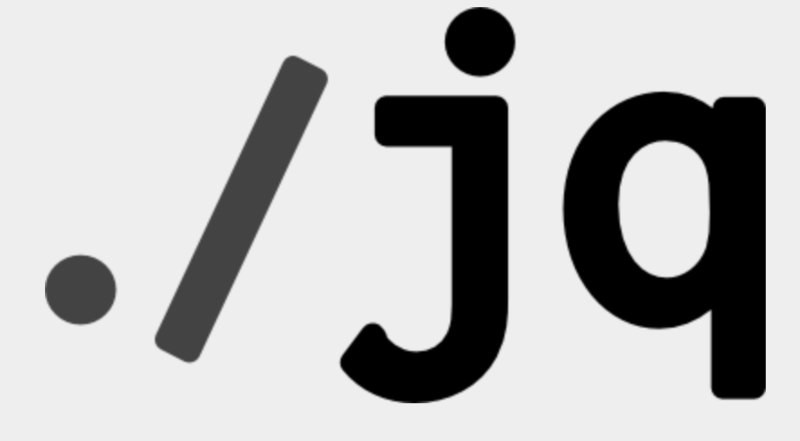 If you are familiar with DX you will likely already be writing or have used shell scripts around the CLI, those scripts are code and the CLI commands and their outputs (especially in JSON mode) is the API in this case. The goal of this blog is to highlight this approach further and also other programming options via REST API or Node.js. Broadly speaking DX is composed of layers, from client side services to those at the backend. Each of these layers is actually supported and available to you as a developer to consume as well. The diagram shown here shows these layers and the following sections highlight some examples and further use cases for each. Programming via shell scripts is very common and there is a huge wealth of content and help on the internet regardless of your platform. You can perform condition operations, use variables and even perform loops. The one downside is they are platform specific. So if supporting users on multiple platforms is important to you, and you have skills in other more platform neutral languages you may want to consider automating the CLI that way. Regardless of how you invoke the CLI, parsing human-readable text from CLI commands is not a great experience and leads to fragility (as it can and should be allowed to change between releases). Thus all Salesforce DX commands support the –json parameter. First, let’s consider the default output of the following command. Now let’s contrast the output of this command with the –json parameter. You can then get a bit more specific in terms of the information you want. You can combine this into a shell script to set variables as follows. The Sample Script for Installing Packages with Dependencies has a great example of using JSON output from the query commands to auto-discover package dependencies. This approach can be adapted however to any object, it also shows another useful approach of combining Python within a Shell script. This is a Node.js library contains core DX functionality such as authentication, org management, project management and the ability to invoke REST API’s against scratch orgs vis JSForce. This library is actually used most commonly when you are authoring a DX plugin, however, it can be used standalone. 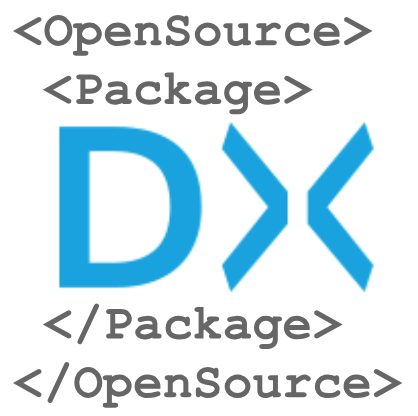 If you have an existing Node.js based tool or existing CLI library you want to embed DX in. The samples folder here contains some great examples. This example shows how to use the library to access the alias information and provide a means for the user to edit the alias names. Finally, there is a host of Tooling API objects that support the above features and some added extra features. 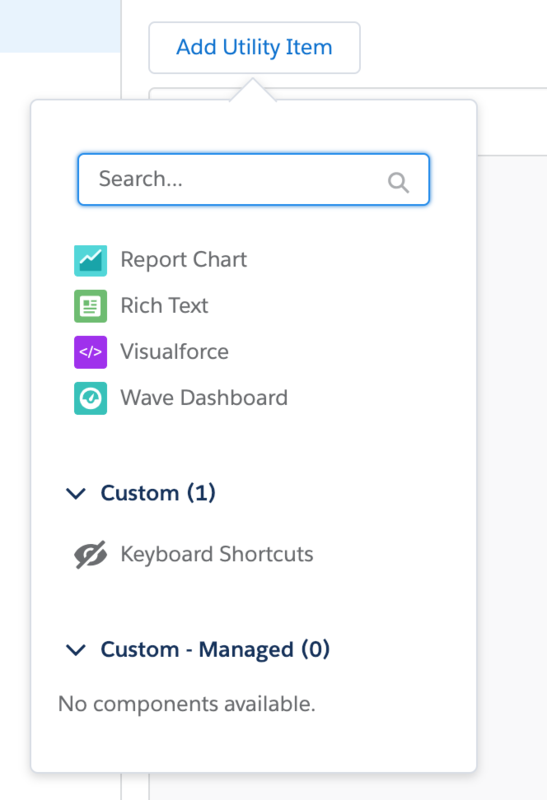 These are fully documented and accessible via the Salesforce Tooling API for use in your own plugins or applications capable of making REST API calls. Keep in mind you can do more than just query these objects, some also represent processes, meaning when you insert into them they do stuff! Here is a brief summary of the most interesting objects. 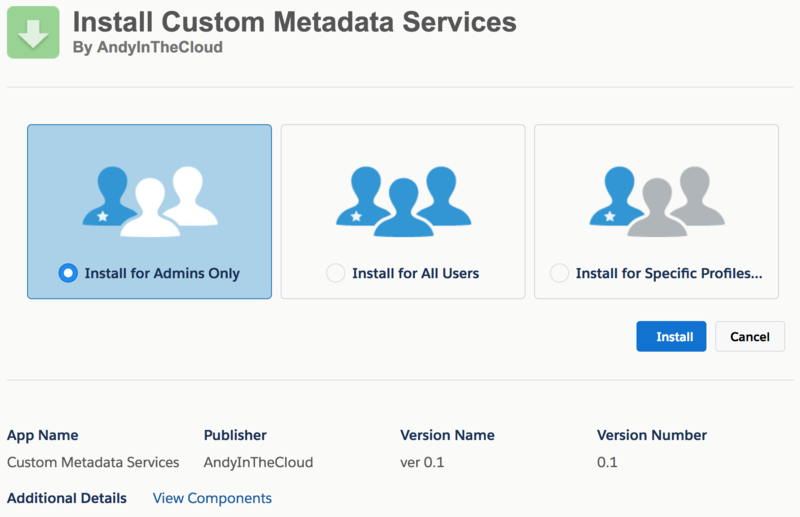 PackageUploadRequest, MetadataPackage, MetadataPackageVersion represent objects you can use as a developer to automate the uploading of first generation packages. Package2, Package2Version, Package2VersionCreateRequest and Package2VersionCreateRequestError represent objects you can use as a developer to automate the uploading of second generation packages. PackageInstallRequest SubscriberPackage SubscriberPackageVersion and Package2Member (second generation only) represent objects that allow you to automate the installation of a package and also allow you to discover the contents of packages installed within an org. SandboxProcess and SandboxInfo represent objects that allow you to automate the creation and refresh of Sandboxes, as well as query for existing ones. For more information see the summary at the bottom of this help topic. SourceMember represents changes you make when using the Setup menu within a Scratch org. It is used by the push and pull commands to track changes. The documentation claims you can create and update records in this object, however, I would recommend that you only use it for informationally purposes. For example, you could write your own poller tool to drive code generation based on custom object changes. IMPORTANT NOTE: Be sure to consider what CLI commands exist to accomplish your need. As you’ve read above its easy to automate those commands and they manage a lot of the complexity in interacting with these objects directly. This is especially true for packaging objects. The above options represent a rich set of abilities to integrate and extend DX. Keep in mind the deeper you go the more flexibility you get, but you are also taking on more complexity. So choose wisely and/or use a mix of approaches. Finally worthy of mention is the future of SFDX CLI and Oclif. Salesforce is busy updating the internals of the DX CLI to use this library and once complete will open up new cool possibilities such as CLI hooks which will allow you to extend the existing commands. Categories: DX, Force.com, Node, Salesforce API, Tooling API, Tools | Permalink. Debug logs are a key tool in triaging and profiling on the Lightning Platform (formerly Force.com) both in development and production. While the Apex Interactive Debugger provides an interactive experience, sometimes you want to monitor, parse or filter logs. Maybe you are reproducing a bug and are watching for a certain SOQL query or method being executed or we just want filter output in different ways. A recent addition to the DX command line from Chris Wall is the ability to effectively stream debug logs from any org connected to DX to the command line console. This is similar to the experience in Developer Console logs pane, but is effectively opening the logs and dumping them out as they are produced on the server for you automatically. You can install the Salesforce DX CLI here. Note that you do not need to have a DX project to use this command. In the following command line example, I have piped the output to another command (grep) that filters the output to show only USER_DEBUG log lines. Pictures do not really do it justice, so here is a short demo video! The command works against any org you have connected to the DX CLI, including production and sandbox orgs. However, if you run it from the same folder as a DX project it will use the currently configured default user/scratch org for that project. Adding a bit of color to your debug logs! The –color parameter used above enables some basic color highlighting for method, constructor, variable assignments etc. You can also customize your own colors by setting the SFDX_APEX_LOG_COLOR_MAP environment variable to an absolute file path to a JSON file per the format shown below. One of the most exciting features for me is the ability to pipe debug logs. Maybe you want to parse out some information to profile how many SOQL statements have been used or aggregate timestamp values (the bit in brackets after the time!) to do some performance profiling… I am looking forward to seeing what folks do with this, please share! The –debugLevel command is optional but allows you to define your own debug level by inserting records into the TraceFlag object (via the DX CLI command force:data:record:create). 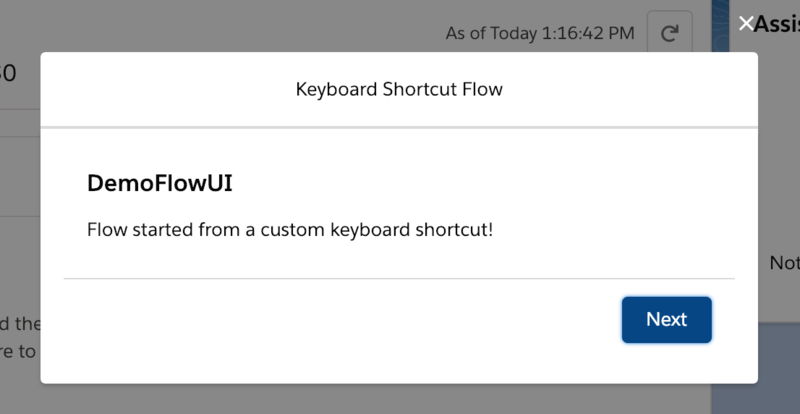 Finally, you can run the command with the –help parameter to get the latest help. Categories: Apex, Tools | Permalink.